Cute asian teen boy doing your homework with laptop computer at home. Asian boy doing your homework with tablet computer and headphone at home. Dolly in. Cute asian teen boy doing your homework and looking a camera with smile face at home. Cute asian teen boy doing your homework at home. 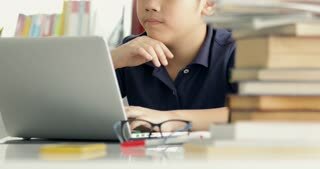 Asian teen boy waring eyeglass and used laptop computer at home, cute boy doing your homework with serious face. Asian teen boy using laptop computer at home, cute boy doing your homework with smile face.